How to make a graph and chart made easy! Have you ever wondered how to make a graph or good chart? It isn't as hard as it sounds. A great graph or chart can really make your project stand out. Unfortunately, many students don't see the importance in these and hastily "throw" something together at the last minute. 1.Judges and science teachers love them, giving you a better chance of a higher ranking. 3.They give lots of information in an easy to compare way. This helps communicate your idea to the judges. So, here's how to make a graph or chart that'll really impress the judges! 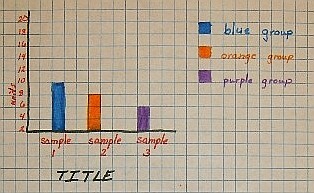 In science, charts normally show lists of numbers or other information that can be compared. They are a great tool for keeping track of information while you are working on your project. 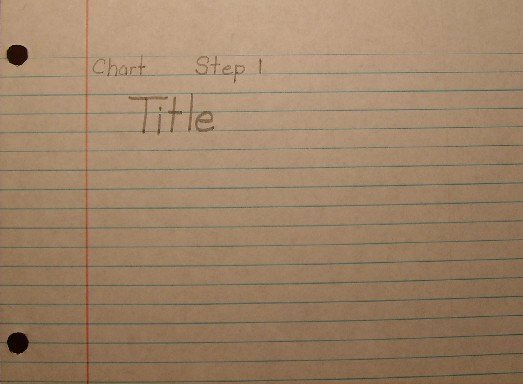 Just fill it in as you get your data for the project. This is called a working chart, and, if you decide to use one of these, you'll have to remake it (neater and more colorful) if you want to use it for display. But the extra time you put in will be worth it if it impresses the judges. 1. First, write a title neatly along the top. This helps you focus on your goal and will help keep your information organized if you use more than one chart. Note: You can make charts using the table feature of many word processing programs. And now we'll learn how to make a graph. In science, graphs normally show comparisons of two or more things. 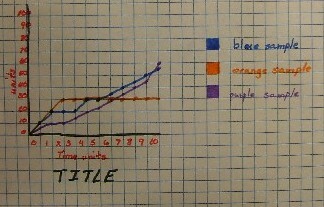 Two types of graphs that are often used in science fair projects are bar graphs and line graphs. 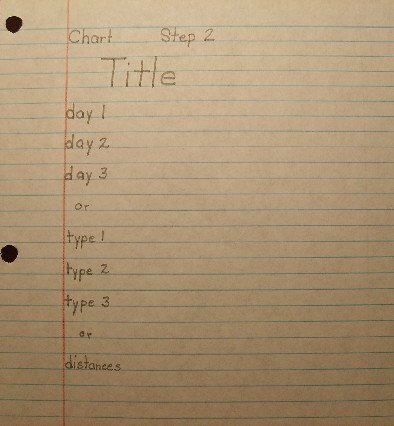 If you want, you may use graph paper to help you make a great graph you can be proud of. Let's go over how to make a graph both ways. 1. First, you'll need to title it and find out how high your graph needs to go. Using information from your experiment choose the biggest number. For example, the number of minutes, feet, degrees, days, meters, pennies, grams. If your number is large you may want to consider counting by twos, tens, or 100s. 4.Fourth, assign each group a different color. Each "bar" should be colored a different color to keep the information easily understood. This also adds color and beauty to your display. 6.Sixth, repeat step five for each group. 7.Seventh, add a title to the top and a color key to show what each color means. Now we'll show you how to make a graph a different way while using similar rules. Normally used to show how things change over time, a line graph may work better with your project. Use a line graph if you measured something each minute, hour, day or week. 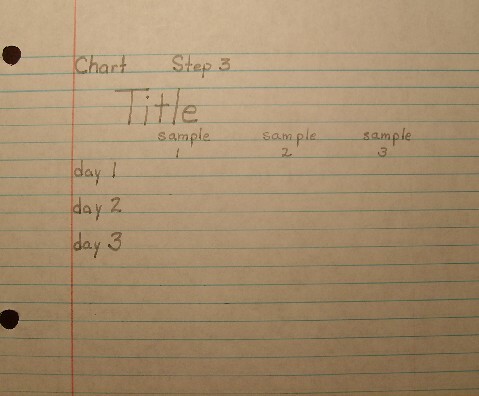 The process is similar to making a bar graph. Note: The first four steps are just like the ones for bar graphs. 1. You need to find how high your graph will go. Using information from your experiment choose the biggest number. For example, the number of feet, degrees, meters, pennies, grams. If your number is large you may want to consider counting by twos, tens, or 100s. 2. Next, begin four lines up from the bottom left corner and list these numbers going up toward the the top left corner. 3. Then, write the times along the bottom on the row below where the numbers begin. 4. Fourth, assign each group a different color. 5. When you're finished with that, begin with one group and make a dot at the correct number above each time. Make the dot big enough to see but not so big it looks like a smudge on your graph. 6. Sixth, draw a line connecting the dots. Use a straight edge for a neater line. 8. Finally, add a title to the bottom and a color key to show what each color means. Some computer spreadsheet applications know how to make a graph and will automatically graph information you put into them. But be careful! 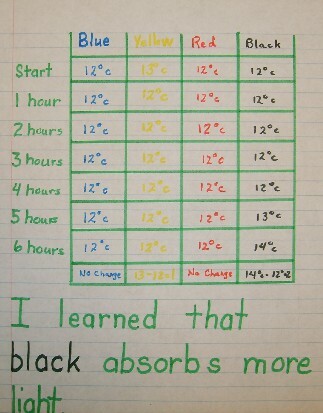 Some science fairs may only allow handwritten work. If not it's best to use a computer generated image for charts and graphs because it looks neater and more presentable. Place your charts and graphs in page protectors. Now you can add them to your report note book, display or photo journal. We hope we've made how to make a graph and chart a little simpler. Hope you do well! Know how to make a graph? Click here to go back! Want more science fair ideas? Try Janice Van Cleave!